The Nokia Lumia 900 runs the latest software currently available. 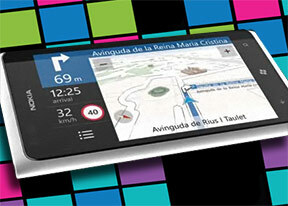 The Windows Phone build is 7.5 Refresh and was revealed at this year's MWC in Barcelona under the codename Tango. Barring some minor added features, the main point was to allow the OS to run on less powerful hardware. This is irrelevant to the Lumia 900 though, which has some of the highest hardware specs available on Microsoft-powered smartphone: a 1.4GHz CPU and 512MB of RAM. That's about to change with Windows Phone 8 which, we all know by now, the Lumia 900 won't be getting. The 7.8 software version is the last major update the current generation of Microsoft-powered smartphones is likely to receive. That way they will at least have the new WP8 start screen with resizable live tiles. That's at least a few months away though, so let's focus on what the Lumia 900 offers here and now. Here goes a video demo of the user interface in action. Swiping the lockscreen up unlocks the device and reveals the live-tile Metro user interface. It's a vertical grid of Live tiles, which can be reordered the way you like. Almost anything can be placed in the grid by tapping and holding down over an app and selecting the Pin to start option. It's a clean and simple interface. Each of the Live tiles display relevant info such as the current date, pending calendar events, missed calls, unread emails and more (third party apps do it too). The Marketplace tile displays the number of updates available, while the Pictures tile is essentially a slideshow of your photos. It's nice to have all that info always available at-a-glance. You can look at them as homescreen widgets of sorts, but that's a bit oversimplifying. The Lumia 900 goes about multitasking like every other WP7 smartphone. It's not true multitasking; things are being done the iOS way. Apps not in the foreground are suspended, but the OS has ways to take over and carry out the task for them. To switch between apps you press and hold the Back key. The app switcher itself looks similar to that of Symbian or WebOS: thumbnail snapshots of the apps, ordered chronologically left to right. Eventually, as you open more apps, the old ones start to drop out from the list. Once an app is gone, you have to launch it again the old-fashioned way, which means you'll need to start over. However, the browser for example will still load the last visited page. Apps with active background tasks (e.g. streaming online radio) will keep on working. Multitasking can be disabled from the settings to save battery life. There you'll also find a list of all installed apps that support multitasking. Windows Phone 7.5 can be controlled through voice only - you can dictate, have the phone read out the reply, you can initiate searches and so on. Other OSes are doing it too - Android's got Google Voice, Apple has Siri and there are a number of third party "virtual voice assistants" available.